Property Size 2,528 sq. ft. Brand new to the rental market! What a location! High end EVERYTHING! Stunning unobstructed Ocean View from everywhere /anywhere in this villa/townhome. This unique property backs up to the sand looking out on BIG water ~ next stop ~ Bermuda ! Enjoy sunrise and sunset from either of the 2 back decks. Direct beach access out the back door ~ walking distance to : 3~4 star restaurants, 2 championship golf courses with a state of the art practice facility that could rival ANY TPC course in this country, beach club with 2 oceanside pools & dining, marina, equestrian center, racquet club, gym, and Charming/Timeless Downtown Charleston just minutes away! What are you waiting for? ~ your dream vacation awaits you! A must see to BELIEVE! 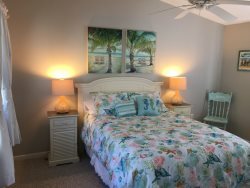 4 Bedroom ~ 1 king, 2 queen, 2 twin ~ sleeps 8 comfortably. 3 car parking, 4 full baths, cable WiFi ~ This is a $ 2 million dollar property folks !!! Oceanfront:Unobstructed Ocean view from every window, and back decks. Property backs up right onto the sand! Towels Provided:Please bring your own beach towels.